All of the thousand different species of carpenters burrow into wood, but contrary to common belief, they don’t eat wood like termites. Instead, carpenter ants create tunnels for nests and passageways that allow the colony to expand. While carpenter ants tend to prefer dead, decaying wood, they can also thrive in damp wood, such as that found in door frames, window sills, around pipes and bathroom traps, etc., causing serious damage to your home that can be structural and expensive to repair. Carpenter ants can do tremendous damage to your home, but the first step to exterminating them is detection. Carpenter ants are among the largest of all ants, with their size ranging from one-sixteenth to one-half an inch long, which can make them easier to spot, but that’s not a foolproof method. They could be burrowed deep where you can’t see them. Also, seeing carpenter ants doesn’t always mean you actually have an infestation. When searching for food, carpenter ants might travel up to 1,000 feet from their nests – that’s more than three football fields placed end to end. 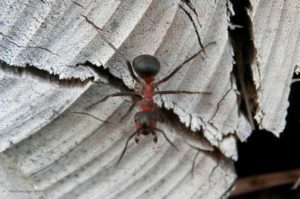 If you haven’t actually seen carpenter ants or termites, you could still detect them through the boreholes they create. Carpenter ant tunnels are hollowed out and relatively neat to make it easy for them to move through them. Termites, however, just eat wood so theirs are sloppier and frequently leave behind a sawdust-like material. 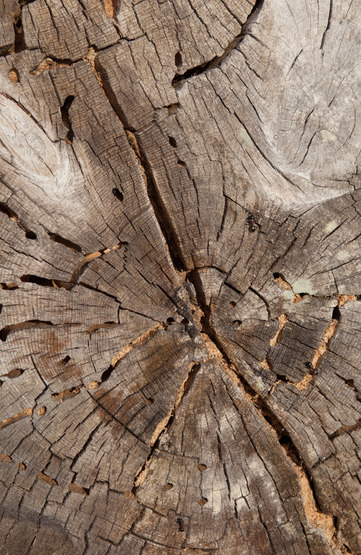 If you think the problem is termites, visit our termite treatment page. Carpenter ants can cause a great deal of destruction. Since the tunnels they make are for nesting, as the colony grows, more and more damage will be done. Combine that with a 60-day maturation cycle for adult worker carpenter ants and an increasing amount of adult carpenter will spread out, making more and more nests in your home’s infrastructure. Plus the ant queen will eventually birth winged males and females who will create additional colonies in your home if left undisturbed. While this is happening, the queens of the colony will have the responsibility of birthing new broods. As the cycle continues the needed space expands to more wood of your home. At a certain point, the queen will birth winged males and females who will go on to create new colonies of their own. If carpenter ants are in your home, they will start these colonies in other parts of your house leading to a much larger problem. Carpenter ant infestations must be treated quickly to minimize the damage to your home. The extermination experts at Twin Forks Pest Control have been helping Eastern Long Island families eradicate carpenter ants through their successful combination of bait traps, dusts and insecticides to ensure the colony will not come back. If you need a carpenter ant inspection and treatment, contact us today at one of our regional numbers or fill out our contact form for a FREE estimate today. 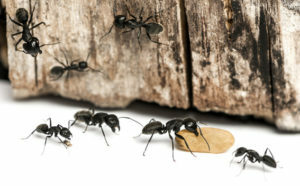 If your Eastern Long Island home has – or might have – carpenter ants, let Twin Forks Pest Control get rid of them. Carpenter ants can lead to major damage and needs to be treated as soon as it’s discovered to avoid worse problems. Our reliable, experienced exterminators can get rid of them quickly and thoroughly, saving you from future damage.